SGLS | German Language Diploma | Deutsches Sprachdiplom as proof of their proficiency in German. More precisely, the DSD I Diploma serves as proof of the necessary language skills required in order to enrol in college-level courses in Germany. Students must be between 13 and 17 years old when they write the exam. The DSD II German Language Diploma is recognized by the German Ministry of Education as proof of the necessary level of proficiency required in order to attend a German university and is considered to be the equivalent of a German secondary school diploma for second language learning (Abitur – Deutsch als Fremdsprache). Students must be between 15 and 21 years of age at the time of the exam. [/wr_text][/wr_column][wr_column span="span4"][wr_image #_EDITTED el_title="" image_file="http://www.surreygermanschool.com/wp-content/uploads/2015/06/DSD.jpg" image_file_button="" image_size_wrapper="" image_size="medium" image_alt="" link_type="no_link" image_container_style="no-styling" image_alignment="center" image_margin_top="" image_margin_left="" image_margin_bottom="" image_margin_right="" appearing_animation="0" css_suffix="" id_wrapper="" disabled_el="no" wrapper_padding_top="0" wrapper_padding_left="0" wrapper_padding_bottom="0" wrapper_padding_right="0" wrapper_bg_color="" wrapper_bg_opacity_slider="" wrapper_bg_opacity="100" wrapper_border_top="0" wrapper_border_left="0" wrapper_border_bottom="0" wrapper_border_right="0" wrapper_border_style="solid" wrapper_border_color="" wrapper_rounded_topleft="0" wrapper_rounded_topright="0" wrapper_rounded_bottomleft="0" wrapper_rounded_bottomright="0" responsive_hide="no" ][/wr_image][/wr_column][/wr_row][wr_row width="boxed" height="auto" background="none" solid_color_value="#ffffff" row_bg_opacity="100" gradient_color="0% #FFFFFF,100% #000000" gradient_direction="vertical" repeat="full" img_repeat="full" video_mp4 video_url_mp4 autoplay="yes" position="center center" paralax="no" border_width_value_="0" border_style="solid" child_of="none" div_padding_top="10" div_padding_bottom="10" div_padding_right="10" div_padding_left="10" ][wr_column span="span4"][wr_spacer #_EDITTED el_title="" height="24" responsive_hide="yes" ][/wr_spacer][wr_image #_EDITTED el_title="" image_file="http://www.surreygermanschool.com/wp-content/uploads/2013/11/Themenlogo_ZFA.png" image_file_button="" image_size_wrapper="" image_size="full" image_alt="" link_type="no_link" image_container_style="no-styling" image_alignment="center" image_margin_top="" image_margin_left="" image_margin_bottom="" image_margin_right="" appearing_animation="0" css_suffix="" id_wrapper="" disabled_el="no" wrapper_padding_top="0" wrapper_padding_left="0" wrapper_padding_bottom="0" wrapper_padding_right="0" wrapper_bg_color="" wrapper_bg_opacity_slider="" wrapper_bg_opacity="100" wrapper_border_top="0" wrapper_border_left="0" wrapper_border_bottom="0" wrapper_border_right="0" wrapper_border_style="solid" wrapper_border_color="" wrapper_rounded_topleft="0" wrapper_rounded_topright="0" wrapper_rounded_bottomleft="0" wrapper_rounded_bottomright="0" responsive_hide="no" ][/wr_image][/wr_column][wr_column span="span8"][wr_text #_EDITTED el_title="" text_margin_top="0" text_margin_left="" text_margin_bottom="0" text_margin_right="" enable_dropcap="no" appearing_animation="0" css_suffix="" id_wrapper="" disabled_el="no" wrapper_padding_top="0" wrapper_padding_left="0" wrapper_padding_bottom="0" wrapper_padding_right="0" wrapper_bg_color="" wrapper_bg_opacity_slider="" wrapper_bg_opacity="100" wrapper_border_top="0" wrapper_border_left="0" wrapper_border_bottom="0" wrapper_border_right="0" wrapper_border_style="solid" wrapper_border_color="" wrapper_rounded_topleft="0" wrapper_rounded_topright="0" wrapper_rounded_bottomleft="0" wrapper_rounded_bottomright="0" responsive_hide="no" ]Currently there are about 51.000 students in over 65 countries participating in the "Deutsches Sprachdiplom" exams each year. The exams of the "Deutsches Sprachdiplom" der Kultusministerkonferenz are prepared by the German Federal Office of Administration the Central Agency for Schools Abroad (ZfA) which also administers a network of advisors on German around the world. Responsible for our school is the advisor for Canada West, Mr. Andreas Meckes at the German Language Agency located in Edmonton, Alberta. Students can earn the DSD I and/or DSD II “Deutsches Sprachdiplom” as proof of their proficiency in German. More precisely, the DSD I Diploma serves as proof of the necessary language skills required in order to enrol in college-level courses in Germany. Students must be between 13 and 17 years old when they write the exam. The DSD II German Language Diploma is recognized by the German Ministry of Education as proof of the necessary level of proficiency required in order to attend a German university and is considered to be the equivalent of a German secondary school diploma for second language learning (Abitur – Deutsch als Fremdsprache). Students must be between 15 and 21 years of age at the time of the exam. Currently there are about 51.000 students in over 65 countries participating in the “Deutsches Sprachdiplom” exams each year. 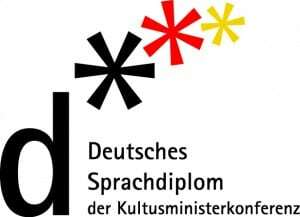 The exams of the “Deutsches Sprachdiplom” der Kultusministerkonferenz are prepared by the German Federal Office of Administration the Central Agency for Schools Abroad (ZfA) which also administers a network of advisors on German around the world. Responsible for our school is the advisor for Canada West, Mr. Andreas Meckes at the German Language Agency located in Edmonton, Alberta. DSD I is an internationally acclaimed academic diploma issued by the Standing Conference of the Ministers of Education and Cultural Affairs of Germany, based on the Common European Framework of References for Languages (CEFR) and attesting to advanced language usage in German and providing the linguistic qualification for enrolment in a German Studienkolleg. The DSD I diploma can be obtained by taking written examinations which will be sent to Germany for evaluation, and an individual oral examination of approximately 10 minutes which will be evaluated at our school. This section tests the candidates reading comprehension by presenting several short (25-80 words) and long (100-300 words) pieces of writing followed by comprehension questions with simple filling (multiple choice, true/false, ticking, cloze texts). The reading part consists of five individual parts and lasts for 60 min. In this section, the candidate is presented with several recordings and asked to fill out comprehension questions regarding the selections played (multiple choice, true/false, ticking). The five individual parts of the listening section include short and simple dialogues of ca. 60 words, as well as descriptive monologues of ca. 450 words, and lasts for 40 min. In this section, the candidate is asked to prove his writing skills by tackling three central questions and a sample text usually writing a letter on a familiar topic. The working time for this section is 75 min. This section is divided in two parts and lasts for 15 min. The first part consists of a guided conversation where the candidate is prompted by the examiner, and the second part consists of a short monologue on a defined subject followed by answering questions on the presented subject. DSD II is an internationally acclaimed academic diploma issued by the Standing Conference of the Ministers of Education and Cultural Affairs of Germany, based on the Common European Framework of References for Languages (CEFR) and attesting to proficient language usage in German and providing the linguistic qualification for enrollment in a German university. The DSD II diploma can be obtained by taking written examinations which will be sent to Germany for evaluation, and an individual oral examination of approximately 20 minutes which will be evaluated at our school. This section tests the candidates reading comprehension by presenting five short (70-80 words) and three long (400-750 words) pieces of writing, followed by comprehension questions with simple filling (multiple choice, true/false, ticking, cloze texts). The reading part consists of five individual parts and lasts for 75 min. In this section, the candidate is presented with several recordings to test the listening comprehension and lasts for 40 min. The three individual parts of the listening section include a dialogue of ca. 700 words, a monologue of ca. 700 words, and four audio sequences of ca. 100 words. The candidate is asked to fill out comprehension questions regarding the selections played (multiple choice, mapping). The candidate is asked to write texts tackling central questions and sample texts. The working time for this section is 120 min. Before the writing exam, the candidate receives a single page with questions and another one with a text and a graph. The candidate should write an introduction (ca. 2 sentences), summarize the text, describe the graph, write advantages and disadvantages of the topic (for example top level sport) and present their own opinion on the topic. This section is divided in two parts and lasts for 40 min (20 min preparation time + 20 min exam time). In the first part, the candidate is expected to deliver a monologue on given keywords and to answer relevant questions in a free and spontaneous way. The second part consists of a monologue delivered on a chosen subject supported by a PowerPoint Presentation, followed by discussion of the presented subject.